Huckletree West gave a presentation of its offering, designed by Studio RHE, as a new “Google-style” facility featuring giant ‘iceberg’ meeting spots, a meditation room, an events auditorium and an Influencer room, where resident digital influencers can live-stream content. The facility will also house a soundproofed glass box named the exit room, where entrepreneurs can finalise their contracts in private. It will uniquely offer a crèche and childcare facility, allowing entrepreneurs to spend more time with their children during the week. Huckletree West will accommodate 500 individual memberships of like-minded individuals representing a multitude of industries including digital, media, fashion and design but with a focus on business growth through technological innovation. There will also be more than 30 private studios, accommodating teams from 6 to 30 people, with monthly prices ranging from £550-650 per person. Tech-entrepreneurs will have access to a Virtual Reality Studio as well as the option to participate in a weekly schedule of wellbeing, which includes yoga classes, guided meditation as well as access to a dedicated meditation yurt. The company, which already has two sites in Clerkenwell and Shoreditch, is backed by 6 investors, including Theo Osborne, the brother of the former Chancellor, and philanthropist Michael Sackler, and has already raised £2.4 million. Huckletree hopes to have at least six co-working spaces in London and 15 in total by 2020. Also on show was a new moveable podcast studio, The Pod, which was designed by Fathom Architects, and the first transferable studio of its kind to be available for public use in the UK. The Pod is a 12m2 moveable structure created exclusively for podcast recordings and is a fully functional studio seating up to six people. The bold patterned façade of The Pod, represented by 350,000 printed ‘pixels’, was generated from the digital script translation of the first spoken words transmitted by radio: “One, two, three, four. Is it snowing where you are Mr Thiessen?” documenting the interference patterns of sound waves. 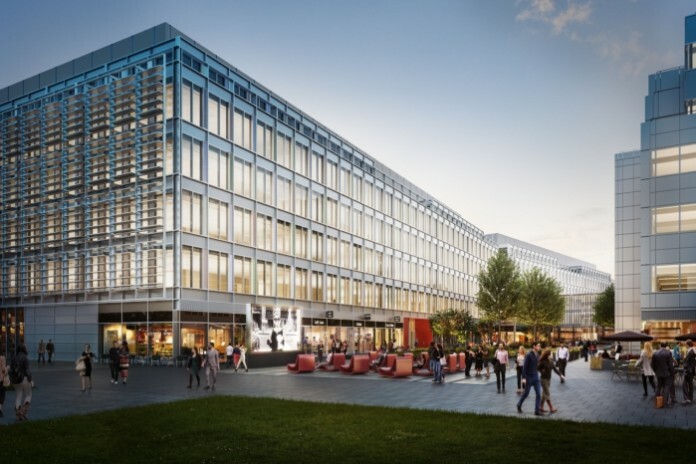 The Pod is part of an innovative podcast initiative at White City Place, the new creative business district at the heart of the £8bn regeneration of White City in West London. The programme will see the opening of The Pod alongside the launch of Thought Starters, a new series of podcasts curated by dn&co, where industry leaders discuss the business value of creativity and share tips on how to keep a creative edge.